Update: Oxygen OS 5.0.1 for OnePlus 5 is now rolling out for OnePlus 5. 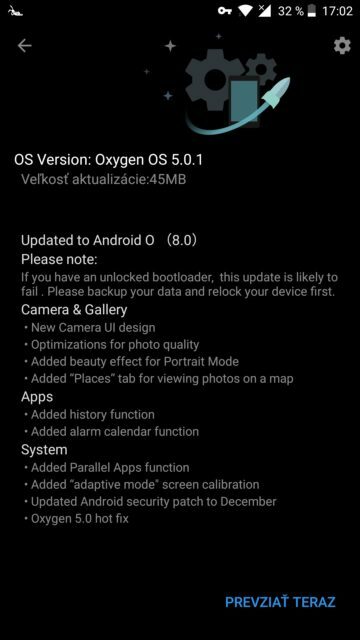 The official OXygen OS 5.0 was abandoned due to some minor bugs. The OTA is now live with yet another OOS 5.0.1 update. Official Oxygen OS 5.0 is now rolling out for OnePlus 5, and apparently, the OnePlus 5T. Today, as a Christmas gift to all the OnePlus customers, the manufacturer is now rolling out the Oxygen OS 5.0 based on Android 8.0 Oreo. This is the first official Oreo builds for the latest flagship phones. OnePlus 5 is finally out of Open Beta and right after the second beta update, the software development team released OOS 5.0 Oreo firmware. The update brings several new features and upgrades to the OnePlus Launcher, Android system, camera, gallery, and all the Oreo goodies. We have captured the OTA and full stock firmware update zip for OnePlus 5 Oreo in the download section below. You will also find installation instructions. Update Log: What’s new with Oxygen OS 5.0.1 for OnePlus 5? OnePlus 5 is currently dawning the Oxygen OS 4.5.15 based on Android 7.1 Nougat. It also received Oreo updates with the Open Beta program. Now, the device is receiving official Oreo update with latest Oxygen OS 5.0. The OnePlus 5T will soon follow the same fate. So stay tuned. And here’s the changelog of this build. How to update OnePlus 5 to Oxygen OS 5.0.1 Oreo? Following is a local upgrade option. You can also dirty flash the ROM using TWRP recovery. The full firmware file is listed below. The above Oxygen OS 5.0 Oreo updates have been captured directly from OnePlus 5 servers. Hence, download the full stock firmware updates from above and install it via Local Upgrade method. Download the Oxygen OS 5.0 for OnePlus 5 full stock firmware from below. How to downgrade OnePlus 5 back to Android 7.1.1 Nougat?